Brand new to RevZilla.com, MOMO Designs is an extremely popular boutique Italian brand of fashion-minded city and scooter helmets. With a focus on protection, design and performance, the MOMO Designs helmet line draws from their extensive experience in the auto and design industries. MOMO Italy is known as a brand that manufactures aftermarket auto parts, everything from road wheels to pedals, delivering Italian style in all of their designs. This aesthetic and attention to the finest details carries over into their line of MOMO Helmets, the MOMO Avio and the MOMO FGTR. 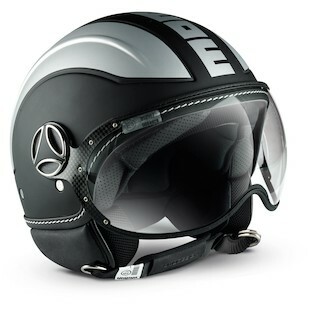 The MOMO Avio Helmet is the top-end lid in the MOMO lineup. Inspired by the designs of fighter pilot helmets, the MOMO Avio touts a style that screams MOMO and is uniquely Italian. However, the Avio isn't all sizzle and no steak. The shell is a fiberglass composite that is both lightweight and resistant to impact. Inside, the cheek pads and comfort liner use materials that are moisture-wicking and feature a silver ion treatment to keep the funk out. Both liner and cheek pads are removable and washable. The faceshield is a spherical visor treated with an anti-scratch coating and blocks UV rays. The shield also features leather stitching around the edge and the supports at the point of attachment are made from aircraft-grade carbon fiber. This is a great choice for the city and scooter rider. Consider the MOMO FGTR the little brother to the Avio. Extremely similar to the Avio, the differentiating factor here is the shell material. While the Avio is comprised of a fiberglass composite, the FGTR uses polycarbonate in its shell. This allows for the price tag to be significantly lower, while offering the same great style and protection as the Avio. MOMO says that the FGTR takes its cue from helicopter pilots' lids, and it shows in the shape and overall design of the helmet. The internal materials, shield and everything else is the same as the Avio, so if the style of the FGTR speaks to you, it could be a great choice within the open face helmet realm. To see comparable choices, visit our open face helmets page.